Our company offers the best Stainless Steel Street Elbow. 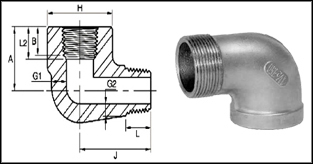 A street elbow is a type of plumbing or piping fitting intended to join a piece of pipe and another fitting at an angle. They can be used in water supply, drainage, sewers, vents, central vacuum systems, compressed air and gas lines, HVAC, sump pump drains, and any location where plumbing fittings would be used to join sections of pipe. Stainless Steel Forged Street Elbow : ASTM A182, ASTM / ASME SA 358, ASTM / ASME SA 312 GR. TP 304, 304L, 304H, 309S, 309H, 310S, 310H, 316, 316TI, 316H, 316LN, 317, 317L, 321, 321H, 347, 347H, 904L. Copper Alloy Steel Forged Street Elbow : ASTM / ASME SB 111 UNS NO. C 10100, 10200, 10300, 10800, 12000, 12200, 70600, 71500.